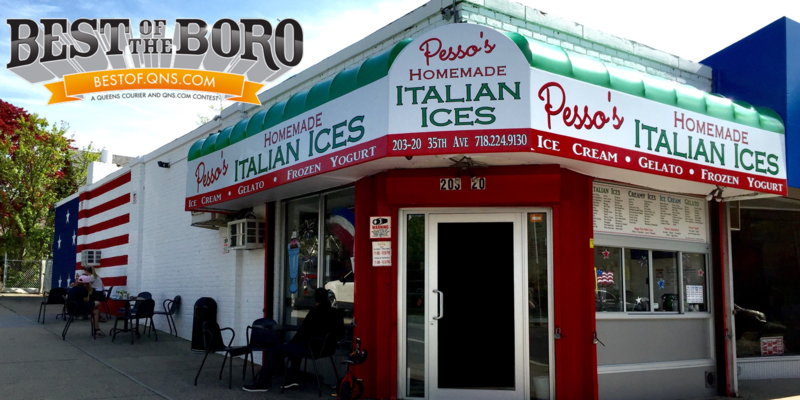 Pesso’s Ices has been family owned in Bayside, Queens, NY since 2004. Our Italian Ices, Ice Cream and Gelato are all made right in the back of our store by members of the Pesso family. We use the best ingredients we can find and make everything in small batches. With over 100 flavors, everyone is sure to find a favorite. We also carry delicious sugar free desserts. Our friendly atmosphere has made Pesso’s a popular neighborhood landmark, and a destination for dessert lovers all around New York City. We’ve been voted the best ice cream in Queens year after year. Come in and sit at the stools by the counter, or enjoy our delicious desserts from our outdoor tables and chairs. Learn about our Rewards Programs! Q: Where do you get your Ice Cream from? A: When we say Homemade, we mean it! We make all of our Ice Cream, Italian Ices, and Gelato ourselves in small batches, by members of the Pesso Family, right in the back of our store. We pride ourselves on our Quality and our Service. Q: What’s in your Ice Cream, Italian Ices, and Gelato? A: We use the best ingredients we can find, and use as much of the real stuff as possible for all of our flavors. There are real Pistachios in our Pistachio Italian Ice, real Cannoli Cream and Shells in the Cannoli Gelato, real Strawberries in the Strawberry Ice Cream, and more! Q: What is Italian Ice? A: Similar to Sorbet or Granita, traditional Italian Ice or Water Ice is a sweet water-based dessert from Italy. The flavors are mostly fruity, but we make ours in a wide variety of sweet and delicious flavors. Check out our Menu for a taste of what we make! Q: Is it pronounced Ice or Icee, Ices or Icees? A: It’s Ice & Ices, no extra “e” needed! Q: What’s the difference between Gelato and Ice Cream? A: Gelato is the Italian version of Ice Cream. Gelato is richer, creamier, and the flavors are more intense than traditional Ice Cream. A lot of the ingredients for our Gelato is imported from Italy. Q: Do you have any New Flavors? A: We offer a wide selection of products and flavors, and we’re always coming up with new exciting flavors! And we absolutely take suggestions and requests! Q: Can I mix flavors? A: Of course! You can absolutely get scoops of different flavors in the same cup! Q: Can I get two different flavors in a 1 Scoop? A: Unfortunately you can only get 1 flavor in each scoop, but you can absolutely get 2 different flavors in a 2 Scoop! Q: How many people does a Pint serve? A: There are about 5 Scoops in a Pint, depending on how big you scoop them out! Q: Can I buy a whole tub? A: We really appreciate that you love our dessert that much, but unfortunately because we make everything ourselves in small batches, we can’t sell our tubs. It’s a challenge just to make enough to sell by the scoop. You can absolutely get a few pints though! Q: How many Calories, Grams of Fat/Sugar/Carbs/Protein are in this Ice Cream? A: We make everything ourselves, so unfortunately we don’t have the nutritional information. But if you’re looking for healthier options, we do have Sugar Free Italian Ices, and our Gelato has less fat than our regular Ice Cream. A: Yes, you can buy a Pesso’s Gift Card online or in our store! We even have eGift Cards that we will email out to you and your loved ones! The minimum for our Plastic Gift Cards is $15 and for our eGift Cards is $5. Q: Can I combine my Punch Cards? A: Of course! Bring in as many of your old Paper Punch Cards as you can find, and we will combine them all so you can get your reward faster! And when you’re all done with those, switch over to our new Digital Punch Cards, so you never lose a card or reward! Q: What’s this new Digital Punch Card? A: It’s just like our old Paper Punch Cards, but easier! No more forgetting or losing cards, just enter your cell phone number at the register, and you’ll automatically get points for buying your favorite Ice Cream, Gelato, Italian Ices, and more! See our Rewards Page for more information! Q: I don’t have a cell phone, can I still get a Digital Punch Card? A: Of course you can – you don’t actually need a cell phone to sign up! You can use a home phone, or any phone-number-like-10-digit-number, as long as you use the same number every time! While you won’t get the text messages to tell you when you have a reward, our registers show you how many Points you have and give you a sweet “Congratulations” message when you earned a reward for your next purchase. Just tell us when you have a reward before we ring you up, and we’ll enter in that same number and you’ll get the reward! A: Yes! We are always looking for new enthusiastic and friendly employees of all ages, all year round! Check out what positions we are hiring right now. Q: I am going in for a medical procedure, what food can I eat before a colonoscopy or endoscopy? A: Your best bet is Lemon Italian Ice! It’s a clear food and it’s incredibly delicious and refreshing! Q: I have a food allergy, what Ice Cream can I eat at Pesso’s? A: While many of our flavors may not directly have any food allergens, we make everything ourselves right in the back of our store, using the same equipment for all of our flavors, and while we do our very best to prevent cross-contamination, unfortunately nothing we make is completely safe for people with food allergies. Q: Do you make ice cream cakes? A: Unfortunately we do not make cakes out of ice cream, but a lot of our customers stick some candles in our Pints, and they love it! Q: Are you really the Best Ice Cream in Queens? A: We like to think so, and so do our customers! We’ve been voted the best ice cream in Queens in 2017 – 2018 – 2019 and voted the Best Dessert in Queens in 2019! Q: I’d like to do an Interview of the Owner for an article/video, how can I reach you? A: We love being featured in articles & videos! You can email us at pessosices@gmail.com to arrange a date and time. Q: I am interested in holding a Fundraiser at Pesso’s, how can I set one up? A: We love fundraisers and helping the community! Please email us at pessosices@gmail.com with more information and we’ll go from there!